The Green Sheet :: E-Magazine :: What same-day funding options should you offer? Same-day funding products are starting to flood the market. It seems every few months another provider launches a similar offering, and it can be hard to distinguish between them and evaluate their costs. Traditionally, it takes two business days for merchants to receive their funds. A few years ago, payment processors started offering next-day funding for a fee, reducing that window to one business day – except for weekends and holidays. The ability to receive deposits on the same day they batch out is a huge perk for merchant businesses where cash flow is important. New same-day funding products give ISOs and merchant level salespeople (MLSs) a new conversation to have with prospective merchant customers – possibly opening doors to new business. Today, merchants can get same-day funding with a number of processors. Many ISOs and MLSs are evaluating whether they can generate revenues by offering this product to their current merchant customers and prospects. This article takes a look at two products that offer same-day funding: Worldpay's FastAccess Funding and Elavon's Fast Track Funding. Elavon's Fast Track Funding makes funds available to merchants via the automated clearing house (ACH) network, based on NACHA – The Electronic Payments Association regulations. This product targets customers who don't bank at the same bank where the ACH payments are processed. 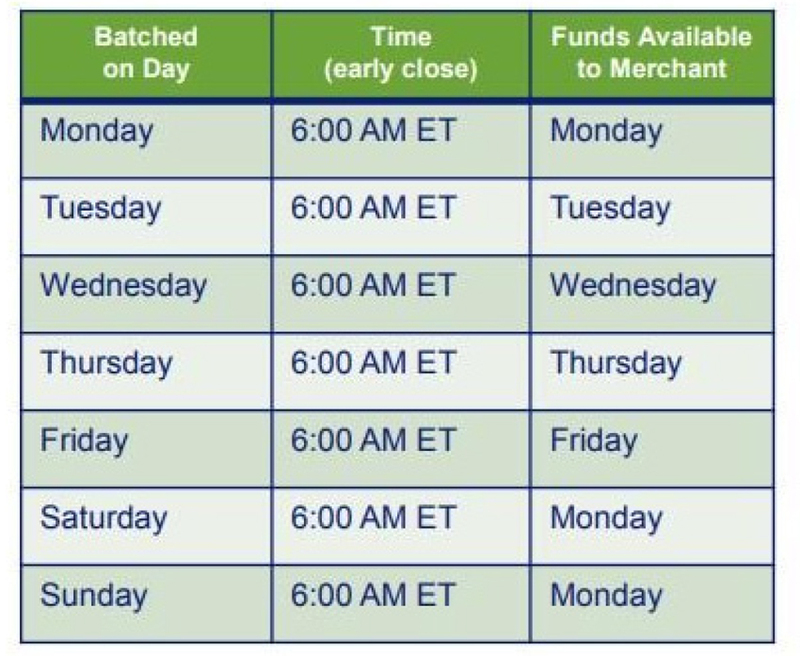 This new service allows merchants to submit batches for payment by 6 a.m. ET to receive funds the same day. It does not fund on Saturdays and holidays. Batches submitted for funding on Saturday and Sunday are funded Monday. There is a batch limit of $25,000. Some issues that have arisen with funding products based on the ACH have stemmed from financial institutions' methods of posting ACH transactions to make funds available to merchants. A merchant's financial institution's timeline for making funds available can very much affect whether the merchant will receive funds right away or the next day. Worldpay's product is called FastAccess Funding. It typically allows merchants to receive daily settlement deposits in less than five hours using merchants' existing Visa debit accounts. Deposits can be initiated at any time during the day and will be processed seven days a week, including holidays. Once merchants are set up for FastAccess, they only need to begin settlement at their terminal or point of sale to receive their total daily settlements in the accounts linked to their debit cards. FastAccess Funding replaces traditional ACH payments to demand deposit account (DDAs). The program requires a merchant to have a debit card on file with his or her merchant account. The batch limit is set at $15,000, but batching up is permitted five times daily. This method allows Worldpay to make monies available on weekends and holidays, unlike the Elavon product. Of course, there is a fee for the convenience of fast funds. This product can be billed two ways: a fee based on the merchant's dollar volume in a percentage form or a per deposit fee. This product can be sold by the ISO channel and is a revenue generator. What differentiates this product is that the merchant can receive payments when batching after hours or on weekends and holidays. Both Worldpay and Elavon's same-day funding products fulfill the purpose of getting funds to the merchant faster. They both speed up the time frame for deposits. Determining which product would work best for your merchants would depend on each merchant's specific situation. If a merchant needs funds every day including weekends and holidays, Worldpay's product would accommodate that merchant the best. If a merchant is closed weekends and holidays, Elavon's Fast Track Funding would absolutely work. Another important factor to consider is the timeline of the merchant's bank for making ACH deposits available. If a merchant experiences delays in his or her financial institution's ACH posting process and you have access to Worldpay, perhaps boarding the merchant there would make sense. The major difference between the two products is related to how the product works. One works via ACH and the other utilizes DDA via a debit card. Pricing is along the same lines for both companies, going with a percentage of volume or a flat fee per batch sent through the express funding channel. Today's marketplace is increasingly challenging. Staying competitive by offering new products is the best way to stay relevant. Having attractive product offerings is also a good way to distinguish yourself. Same-day funding gets our merchants' attention when cash is a factor in running their businesses. We target restaurants, liquor stores, convenience stores, hospitality businesses and retailers. Dee Karawadra is the founder, Chief Executive Officer and President of Impact PaySystem LLC, based in Memphis, Tenn. He and his team have a wealth of knowledge on the merchant services industry. Dee's experience on the street as an agent guided him in laying a foundation for an agent program that is both straightforward and lucrative for his agents. Contact him at 901-601-0032 or dee@impactpays.com.